My Padded Needlelace came about from doing Raised Elizabethan embroidery.It is the layout of the design that is the real difference between the two. 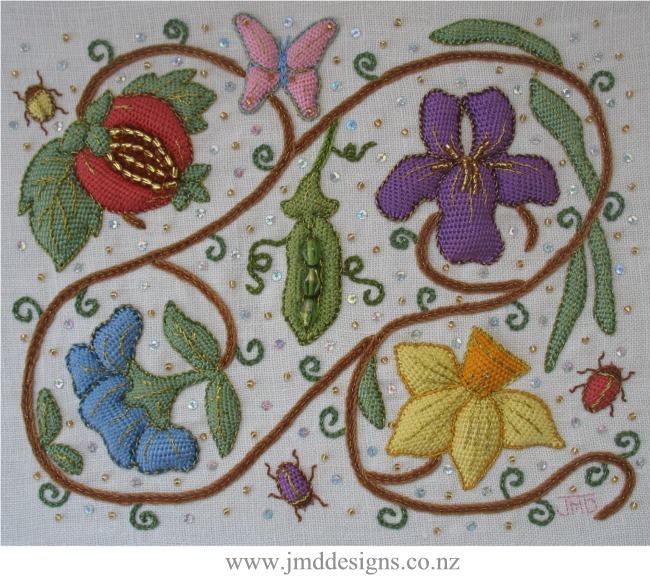 Raised Elizabethan designs are full of vines with flowers and bugs among the vines. 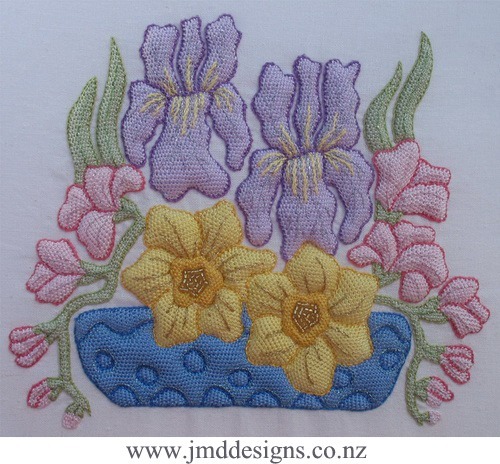 Padded Needlelace can be of any type of picture/layout in a design. 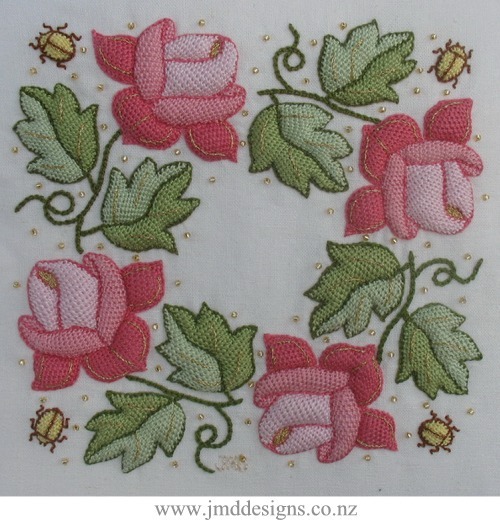 Raised Elizabethan embroidery has become most popular again in the last 20 years. What was last seen in the early 17th century England is vogue again. The raised and stuffed pockets of Needle Lace bringing to life the design features. 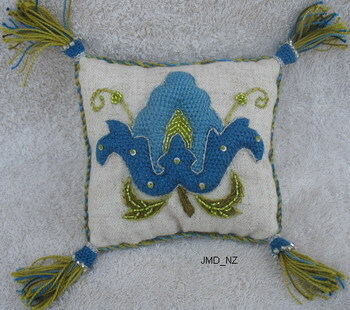 Early pictures of this embroidery can be found on pillows or small bags that were carried at the waist etc. Prominent to the 17th century designs were flowers, fruit, vegetables, bugs and butterflies. Traditionally scrolls of vines were entwined around the flowers etc. A mass of design objects and vines covered the area being stitched. Today many design looks are given to this raised technique. The world being our oyster to choose from. 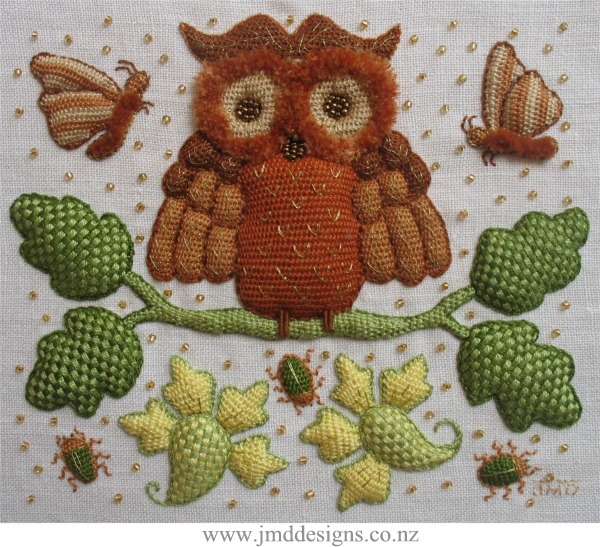 If the shape of the design element can be filled with rows of Needle lace, then go for it. Today Cotton a Broder, Pearl Cotton or Stranded threads are most popular. Designs of yesterday and today are highlighted with silk and metallic threads. 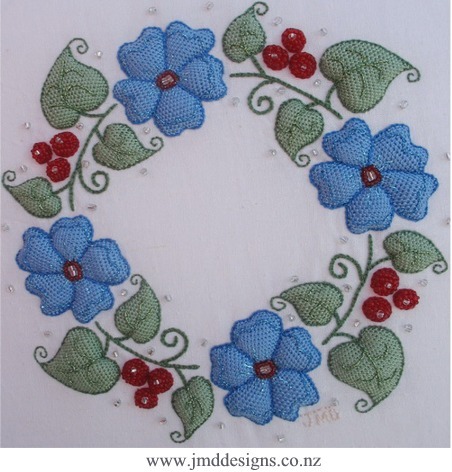 Beads, sequins and spangles, used to bring life to the design. Vibrant colours were used in the past. 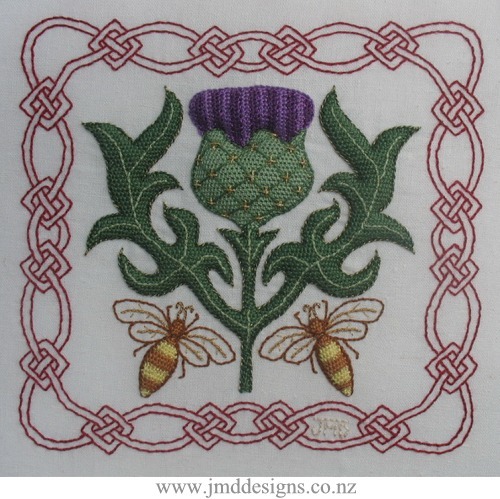 Colours being realistic to the design being stitched. But today...... what ever makes you happy. A firm close weave background fabric needs to be stitched upon to support the stuffed Needle lace. Either Linen, Cotton or other furnishing fabrics are suitable. 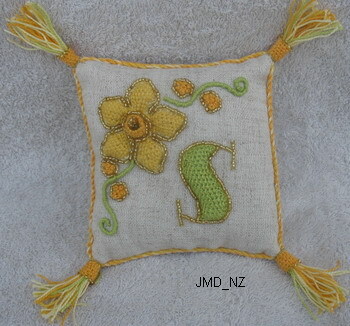 This is a modern design based on Padded Needlelace Needlework. 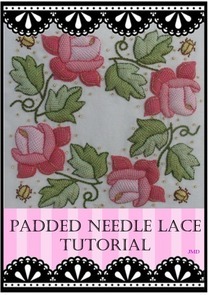 Pockets of Needle Lace are stitched directly onto the fabric and then padded to produce raised stitched areas. Metallic thread add texture and appeal to the design that reminds me of peace and love. The design is 9 x 10.5 cms (3 1/2 x 4 inches) in size. Traditionally linen fabric is stitched on. A hand dyed Quilting fabric has been used for this design. Anchor Marlitt rayon stranded thread has been used to stitch with. But note that Perle 8 and Cotton-a-broader #16 can be used successfully also as a substitute for rayon thread. Stranded cottons, rayon and silks can be used but only if you have good even tension with the strands in the needle while stitching. Perle 8 is suggested for use for those new to the stitching of Needle Lace. 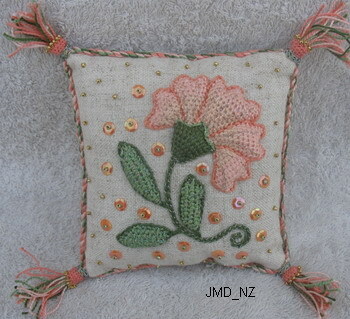 The 4 miniature pillows above I hand made using the Padded Needlelace Needlework method of padded Needle Lace. 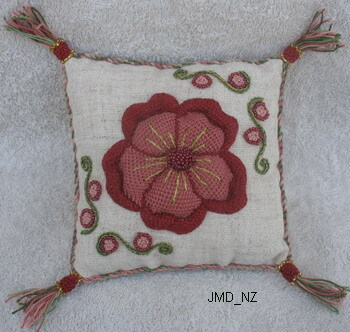 Each pillow is about 10cm (4 inches) square. 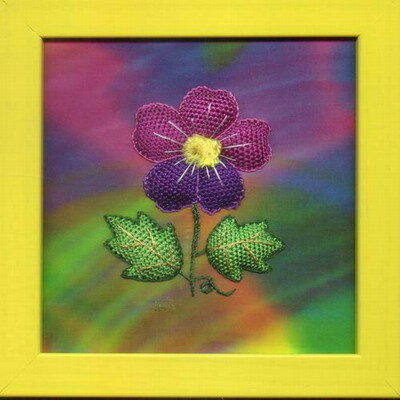 A variety of Pearl 5 cotton thread, various metallic threads, beads and sequins were used. The edges have hand made twisted cords with the end of the cords made into a tassels. these were made as gifts for Christmas 2005.